We owned the Centurion Appaloosa Ranch in Sun Valley, California, La Tuna Canyon. We needed a stud so after much looking we purchased Rojo and Bixby. 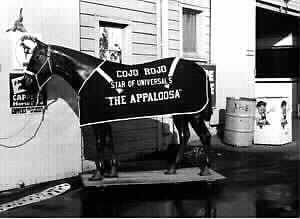 Jack, my husband then, worked at Universal and he kept watching the Appaloosa horses come and go on the lot. One day he asked what is it was all about and they told him about looking for a horse for South West to Sonora. Later to be changed to "The Appaloosa". They asked him to bring Bixby on in because he was black and black is what they wanted. He had a roached mane for showing and so that dumped him. The director said get me a horse just like that one but with a mane. We sent for Rojo, he was racing at Bay Meadows (race track located near San Francisco California.) Ok... we'll take him, but make him black, the rest is history. They dyed him black and off they went. Bobby Davenport was the trainer and I believe Roy Williams worked as a wrangler. 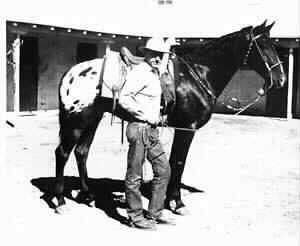 One of George Spahn horses was a double and he died in Utah so Rojo had to do most all the shots. Rojo means red in Spanish. Rojo and Bixby were sired by Cojo Mapachi and Rojo was out of a Registered Thoroughbred mare, his half brother from the Fred Bixby rancho in Lompock, California They were six months old when we bought them. Rojo was a blood bay in color. Bixby was attending the show circuit and Rojo was racing. 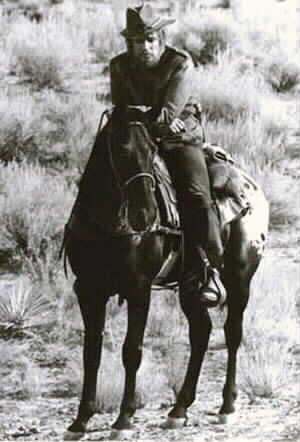 of the 1966 movie "The Appaloosa"
The story goes that a lame Indian was living on the land when Mr. Bixby purchased it and that is how the name came to the ranch. 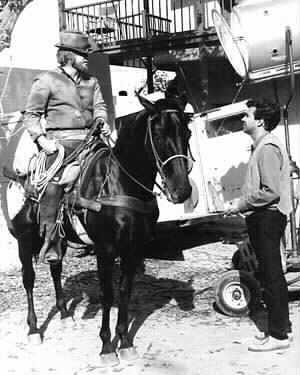 Rojo was sold shortly after the movie was released for a very large sum at that time and I was told later that he had won a Patsy. I have never seen that in print so don't have proof of that. Rojo spent the duration of the Los Angeles County Fair the year the film was released on exibit. Universal had a wonderful sign made and he had a blanket also with his name on it. Here is a photo of that time at the Fair. During the the fair, I went from Saugus, California - where we had moved our ranch, to Pomona, California everyday and back, just to feed and exercise Rojo. One day I was riding him in the arena and the horse races were taking place on the race track. Dang starting bell rang ... and Rojo liked to jumped right out from under me. Guess he thought he was back on the track. trainer Bobby Davenport at the stables with Rojo. Notice his dye job on the blaze has worn off. left photo: standing - movie director Sidney Furie descussing something with Marlon Brando. 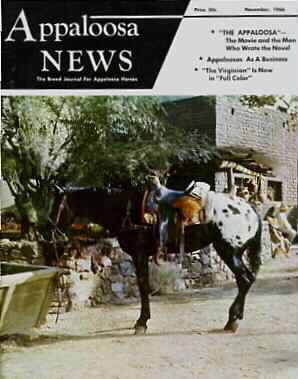 He was also on the cover of The Appaloosa News! There are several write ups about Rojo. Some good ones! It has a super story on the movie plus a story on the author and his background, seems he was an artist for Red Rider Comics. Rojo was six years old during the movie production. Cojo Rojo would have to be dead by now. The movie was made in the sixties. Its located close to tail and above hock, they swiped the dye and didn't feather it. If anyone knows what became of Cojo Rojo let us know !